A throwaway prototype sounds pretty much what it is – you create a “prototype” and when you are done with it you throw it away. For example, you and a co-worker go to lunch and you come up with a great idea for a new product. 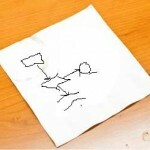 As you discuss the idea you start to jot down the ideas and draw out the initial design on a paper napkin. When you get back to the office you take the “prototype” on the paper napkin and transfer it to the computer. You then throw away the napkin. That napkin, in this instance, would be considered a throwaway prototype. Tagged with Activity, Elicitation, prototype, Requirements, Throwaway.